Last week I wrote about new year’s resolutions and the basic human drive for continuous improvement and growth. Having a goal in mind and a sense of direction helps us make small decisions and choices along the way to accomplish what we have set forward. As Alice found out from the Cheshire Cat, without an end in mind any road will suffice. Equally as profound, Yogi Berra reminds us that without an idea of where we are going, we will end up someplace else. 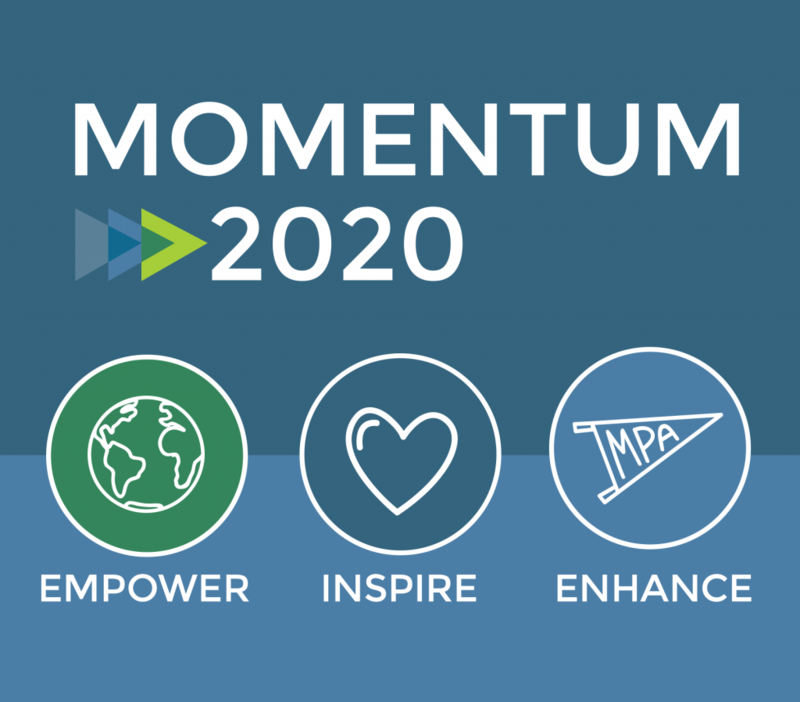 As we mark the mid-way point of the school year, it has been my custom to provide an update on Momentum 2020, our school’s long-range strategic plan. Approved by the Board of Trustees in January of 2015, Momentum 2020 is the result of nearly a year of research, conversation, visioning, and strategic thinking that involved hundreds of students, parents, faculty, staff, alumni, and parents of alumni. Together, we’ve made incredible progress over the past four years. Part operational and part inspirational, Momentum 2020 has provided the direction necessary to realize our vision and meet our mission. Click here to review the progress made in the last four years of Momentum 2020. And find below a brief overview of progress made so far this school year in addressing our annual goals and priorities. MPA achieved an important milestone this fall by successfully completing the re-accreditation process. Our Visiting Team from ISACS (Independent Schools Accreditation Association of the Central States) affirmed the direction of the school and the accomplishments made. In recommending full re-accreditation, visiting team chair Kevin Breen said, “That sense of purpose permeates everyday life and informs each new initiative… The community’s shared values are known, understood, and enacted at an extraordinary rate.” Moving forward, the school will fully leverage the commendations and recommendations to launch our next round of strategic planning this fall. Progress continues to be made in engaging students in creative and innovative learning experiences. The Makerspace continues to be a wellspring of 21st century learning. For example, our kindergarten and first grade classes read “Three Billy Goats Gruff” and then came to the Makerspace to design a bridge to carry a goat and cargo across the bridge. Students worked through the design thinking process by defining the problem first, sketching ideas, and then building and testing their bridges. They were given one constraint: bridge length. They worked in pairs, one kindergarten and one first grade student, while collaborating, problem solving, and iterating. At the end of the lesson, they discussed growth and fixed mindset, terms they have been using with their teachers. Middle School students are being challenged as well, integrating technology in new ways and utilizing the Makerspace in creative ways. As quarter three begins, eighth graders will create Hummingbird Robot projects. The Hummingbird is an incredibly flexible robotics board that can be used with a wide variety of materials. It incorporates sensors, servos, and motors to allow students to build and program robots extremely creatively. In the Upper School, two new courses have been added: a computer science class and a Makerspace class. In computer science, students learned Python programming and created their own text-based games and projects using that knowledge. As a final project, students have been working with the programming environment Processing to create interactive visual works with code. They also studied several well-known algorithms, along with discussing how computer scientists measure the efficiency of algorithms. I couldn’t agree more. Know that in partnership with the Board of Trustees, I am doing all I can to ensure we continue to recruit, reward, and retain this amazing faculty and staff. Approximately 75 percent of our operating expenses are directed to compensation. As a parent and as a head of school, I strongly believe this is a key priority. A new initiative that has been introduced this year is directed at helping faculty and staff find balance in their lives. Once a month, time is set aside to “unconference,” facilitating opportunities for employees to build relationships with one another, both personally and professionally. Driven by faculty and staff themselves, individuals volunteer to share their interests and passions with one another and faculty and staff then choose the “unconference” they find most intriguing. Growing enrollment continues to be a major focus of our school-wide efforts, from the classroom to the boardroom. Our Strategic Marketing and Enrollment Plan developed as a result of Momentum 2020 is evaluated and enhanced each year. We were extremely pleased to welcome 86 new students and their families this year, the highest number in the last eight years. A new initiative designed to lower attrition is now in place and faculty and staff from across divisions and offices are working together to better meet the needs of our students and families in a focused effort. Enhancing our institutional capacity to ensure MPA’s future also requires that we provide the resources and facilities necessary for students to succeed and flourish. Over the past several years, the partnership between parents and the school has resulted in significant enhancements, from the Makerspace to the Black Box, from the renovated bathrooms to the refreshed playground. We continue to implement our master facilities plan and look forward to sharing some very exciting news with you soon about the immediate future. I am incredibly pleased with the progress we have made and yet there is always more to do. Over the last four years, the direction provided by Momentum 2020 has resulted in incredible success and dramatic improvement in many, many areas. Know we will continue to push forward, challenge ourselves, and see ongoing improvement. I am excited about what lies ahead for our community and thank you for entrusting your children to Mounds Park Academy.